Ultra-Portable Passing Trainer that perfects accuracy to key receiving areas. 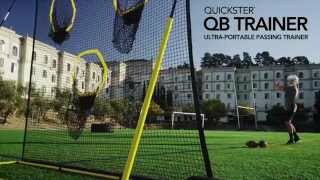 Hit the numbers and practice like the pros with the Quickster® QB Trainer. Using the same revolutionary patented design as all the other Quicksters, perfect your passing skills with three numbered passing targets. Taking only 90 seconds to fully assemble, and even less to take down, the net spans to a full 7' x 7'.